Art Shibayama, who was profiled in the Feb. 10, 2017, issue of the Pacific Citizen, will finally get a hearing on March 21. Isamu Carlos “Art” Shibayama, who was among the more than 2,264 Japanese Latin Americans (JLA) kidnapped from their homes in 13 Latin American countries during World War II by the United States government to be used in hostage exchanges with Japan, will finally get a hearing before the Inter-American Commission on Human Rights (IACHR) in Washington, D.C., on March 21, from 8:30 a.m., in the Padilha Vidal Room. Although the IACHR hearing comes nearly 14 years after Shibayama had submitted the petition, Shimizu said this was not uncommon and that they had been given expedited consideration. Had the petition followed chronological order of filing, Shimizu said they may have had to wait another year and a half. “It just goes to show you that there’s a lot of human rights violations going on,” said Shimizu. The Civil Liberties Act of 1988, which issued an apology and a token compensation of $20,000 to Japanese Americans imprisoned in U.S. concentration camps during World War II, was interpreted to exclude the majority of JLAs from the bill. The federal lawsuit Mochizuki v. the United States, which sought redress for JLAs, offered a controversial settlement of a mere $5,000 and an apology to eligible JLAs. Several lawsuits filed in U.S. courts by the Shibayama brothers and other Japanese Latin Americans were dismissed on technical grounds similar to the way the National Council for Japanese American Redress was dismissed. Two pieces of legislations, sponsored by the late Sen. Daniel Inouye of Hawaii and Xavier Becerra, former congressman and current California attorney general, were unsuccessful. Shimizu said they are hoping for a favorable ruling by the IACHR, whose mission it is to promote the protection of human rights in the American hemisphere, which includes the U.S., Canada, Latin America and the Caribbean. However, while the IACHR has no enforcement authority, the commission’s ruling can clarify and strengthen international law and legal protections. “The body does not have enforcement powers like the criminal courts, but their ruling can interpret or set a precedent for international law,” said Shimizu. “So, if the Trump Administration feels that this is an important ruling and they agree with it, the U.S. government, then, can abide by the ruling. But if it does not, still other victims of human rights violations in the Americas can point to this ruling and use it in their cases. In addition, Shimizu pointed out that this hearing offers them an opportunity to continue educating the public. Shimizu said the CFJ has been getting inquires as far away as Brazil and Japan. During World War II, the U.S. government had considered using U.S. citizens of Japanese descent incarcerated in the War Relocation Authority and Department of Justice camps in hostage exchanges with Japan for U.S. citizens, many of Western European descent, caught in the Far East war zone. However, exchanging an American for another American, on basis of race or national descent, had constitutional violation issues, and instead, the U.S. government collaborated with 13 Latin American governments to round up persons of Japanese ancestry living in Latin America (both citizens and immigrants) to be used in hostage exchanges between the U.S. and Japan. Shibayama’s maternal grandparents were used in a hostage exchange with Japan during the war, and he never saw them again. The majority of JLAs were imprisoned at the Department of Justice camp in Crystal City, Texas. Once the war was over, the U.S. government continued to classify the JLAs as “illegal aliens,” and some of the Latin American countries refused the return of JLAs. As a result, most of the JLAs were deported to Japan. Several hundred were able to fight deportation with the help of civil rights attorney Wayne Collins; of these, many were paroled out of camp to work at Seabrook Farms in New Jersey. 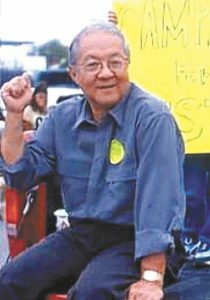 Shibayama, even though classified as an “illegal alien,” was drafted into the U.S. Army in 1952. While serving in the military, Shibayama’s commanding officer encouraged him to apply for U.S. citizenship, but Shibayama was denied on grounds that he had entered the country illegally. Shibayama would not be granted U.S. citizenship until 1972. When the ruling came down on the Mochizuki lawsuit in 1999, Shibayama opted not to accept the settlement and made the decision to continue fighting for equitable redress for JLAs. Shibayama added that he found the apology letter that the JLAs received under the Mochizuki settlement offensive. “The letter came on a plain sheet of paper,” said Shibayama. “It’s not even on presidential letterhead like my wife’s (who is a Japanese American). The ones they sent to the Japanese Latin Americans are just on a plain paper and don’t even mention the Peruvians or Japanese Latin Americans. Currently, the Campaign for Justice: Redress NOW for Japanese Latin Americans! is collecting signatures on a petition through Change.org (https://www.change.org/p/inter-american-commission-on-human-rights-justice-now-for-the-shibayama-brothers), which will be submitted to the IACHR on March 21. The petition is available in English, Spanish, Japanese and Portuguese. Those who do not have access to the Internet are asked to send a letter with their signature to “Campaign for Justice,” P.O. Box 1384, El Cerrito, CA 94530. Some points to include in the letter are the importance of this case, not only for the Shibayama brothers, but also for all people who have suffered during wartime from government abuses; and to request a favorable ruling in this case. The delegation is also raising funds to cover legal and travel expenses. Checks should be made to “Campaign for Justice” and mailed to the El Cerrito address. For more information, send inquiries to JLACampaign@gmail.com or visit https://www.facebook.com/campaignforjusticeJLA/.